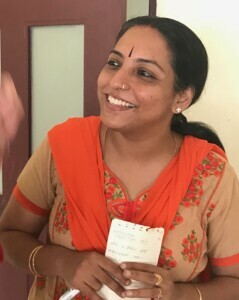 In September we have invited Nrithya Jagannathan, one of the fantastic teachers from our ”mother school” KYM in Chennai India. Yoga has always insisted on a holistic view on the human system. The ancient text Tattiriya Upanisat presents a model of five interlinked layers (panca maya) which can be used both to undertand how our problems can spread from our body, to our breath and mind or vice versa, and the same model can also be used to understand how the tools of yoga works. Nrithya has studied this text and taught about this model for many years. It is one of her favourite subjects in Yoga philosophy. During the course there will be both practical sessions and lectures.